The ZieherSmith Gallery in NYC current group exhibition is titled “Evidence of Absence”. 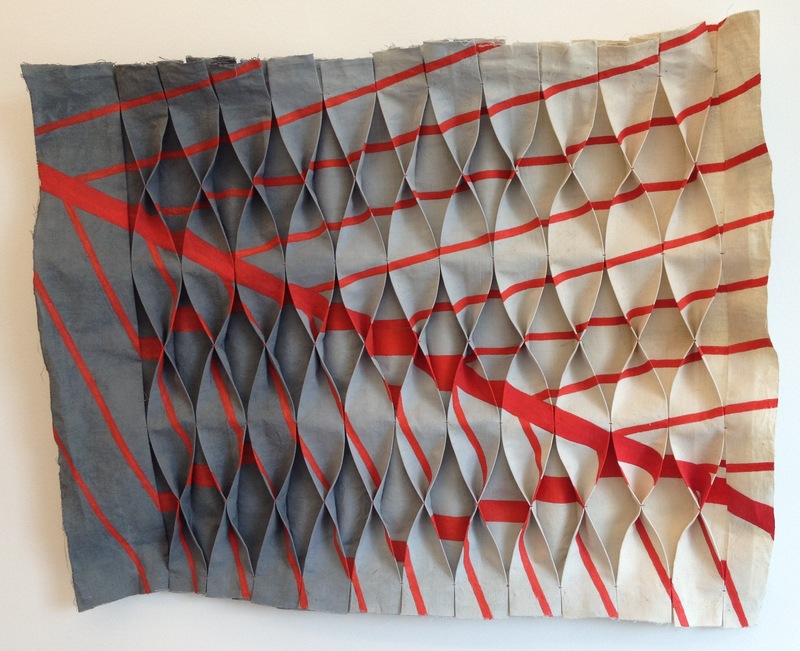 Two of the artists in the show create work that uses mutated repetition of geometric shapes. Ryan Mrozowski makes wood blocks that are coated in acrylic and vinyl then they are held together in a rectangular frame. This creates a patterned plane or a 2D tiling pattern from 3D blocks. His assemblages give the illusion that all of the blocks started out the same size and shape, but they have been squished together and distorted by the limits of the frame capacity. 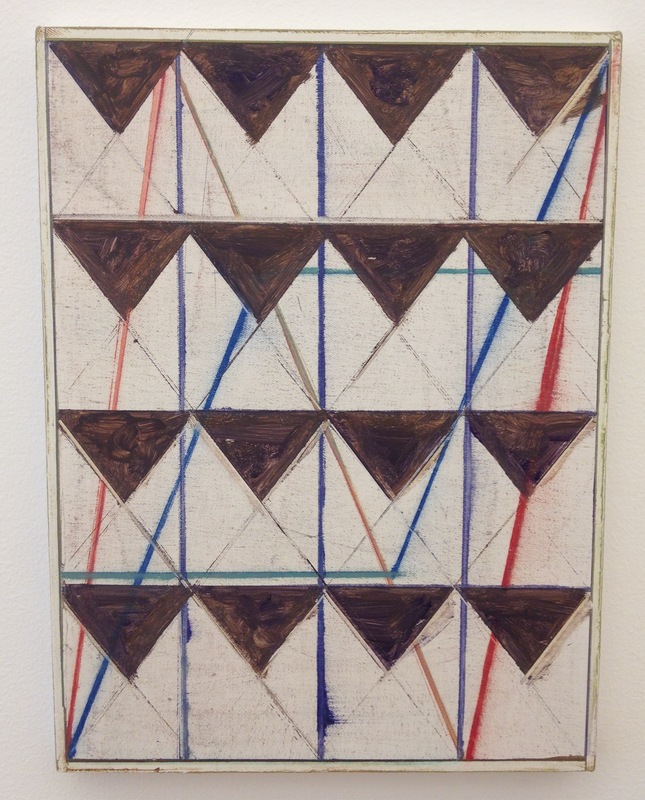 In Mrozowski’s “Dark, Blue, Maroon, Green III”, rows of isosceles triangles appear to have been compressed into a frame that is too small, distorting the geometry of what could have been a very repetitive geometric pattern. As the viewer I get the feeling that the order we associate with mathematical patterning has been disturbed and mutated. So it is the imaginary starting point of this pattern before it was compacted that holds the mathematical connections. Although the wood blocks are solid, there is the false appearance of plasticity that hold the memory of the geometrical starting point. Adam Winner creates minimalist paintings with a hand-made edge. Instead of brushes he uses palette knives, instead of a smooth solid canvas he pieces together torn linen canvas. He uses the rough edges of the linen to create straight lines. Winner is interested in the Golden Section and incorporates this into the proportions of his work. Winner’s untitled oil painting above features a series of twelve concentric rectangles (including the outer edge of the canvas). This is a theme that has been explored by Minimalist artists including Frank Stella, but Winner’s unique technique breaths new life into the subject matter. Earlier interpretations of the parallel lines of concentric rectangles relied of the slickness of clean and accurate lines. This painting has rough not quite perfect lines created from the torn edges of canvas strips. I am always looking for work like Winner’s that revisits how mathematics has been used before, but in some way alters the process. Denise Bibro has two adjacent gallery spaces in Chelsea. The main Gallery and in a separate room, the Platform Project Space. On a recent visit, the drawings of Henry Bermudez were on display. Two of the drawings have very mathematical frameworks, that create structure for his freehand patterning. Bermudez is a renowned artist, who has exhibited extensively throughout the world. His work is included in many important collections. He represented his native country of Venezuela at the Venice Biennale in 1986. Bermudez takes inspiration for his art from pre-Columbian and religious themes. 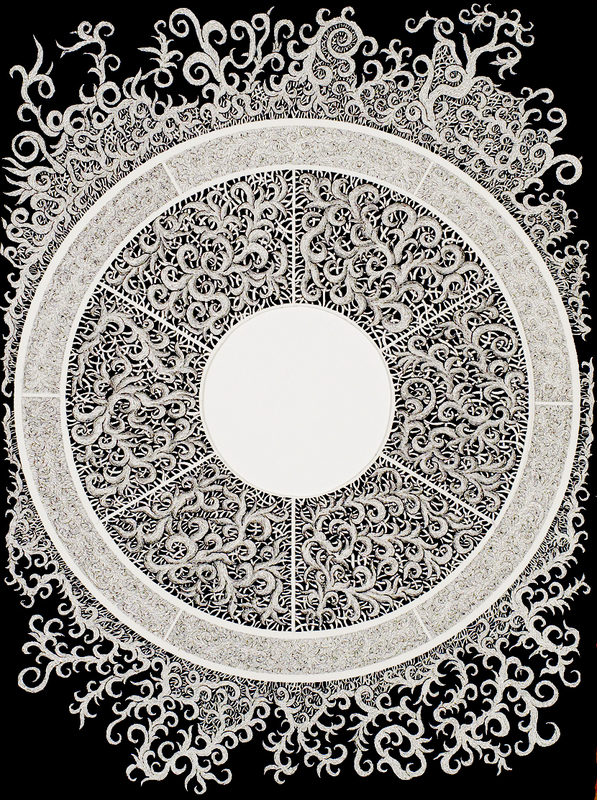 His black on white drawings are intricate and detailed with swirls of patterns. In the drawing “Square” the swirling pattern is broken up by a vertical line bisecting the paper and a line drawing of a square in the center of the page. The bisecting line creates a line of symmetry for the square. 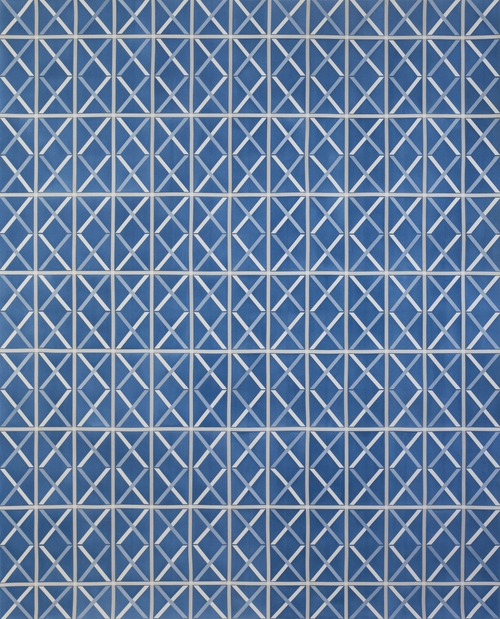 This symmetry seems to anchor Bermudez’s frenetic free-for-all of patterning. The exuberance of pattern is also evident in the drawing “Center Piece”. This drawing again features the curls and waves of pattern. This time – however – the structure is based on a circle. The circle has been divided into two separate concentric rings and a center circle that is empty. The inner ring is divided in to six equal sections. The outer ring is also made up of six equal sections but it has been rotated 30 degrees. The two rings each have a different type of patterning. In this drawing you can really see Bermudez’s cultural influences. There is a connection to pre-Columbian calendars. Bermudez uses geometric mathematical frameworks to create order for his freeform patterning. In the main gallery there is a group show of ten artists titled “Process”. I was immediately drawn to the work of David Ambrose. He has a very interesting approach to working with paper. He first pierces the paper, making a multitude of tiny holes with raised lips. These pierces create patterns. When a pigment is then applied to this uneven surface it is forced to interact with the pattern. 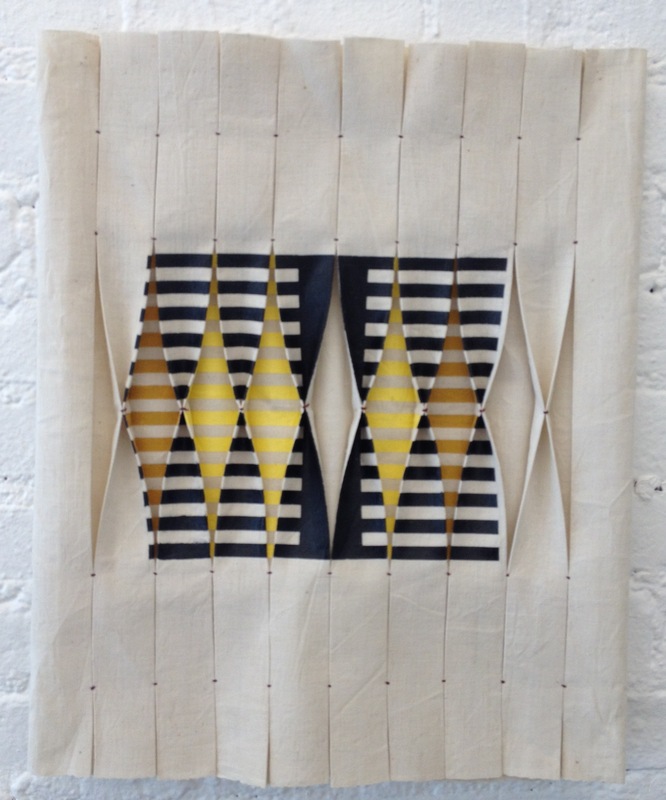 The punctured patterns in “High Kente” have an architectural element. Near the top there is a circular form divided up into ten even segments. It reminds me of patterns found in both stained glass windows and Middle Eastern ornamentation. There are other sections of the paper with rectangular grids and other geometric forms. 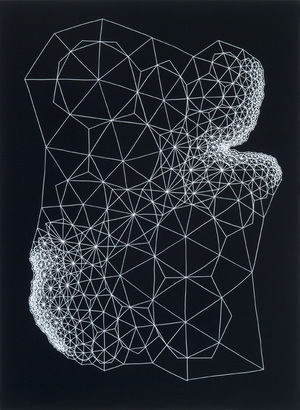 Some of Ambrose’s work uses lace patterning as inspiration. 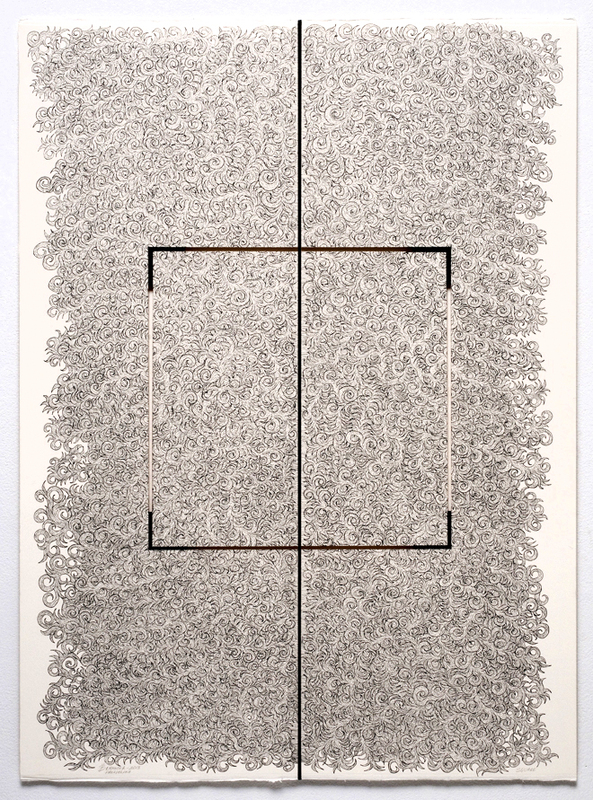 The piercing of this work creates a type of paper lace. Lace making is probably one of the most mathematical of all needlework. That mathematical sensibility has carried over to this watercolor on pierced paper . The German artist Pius Fox is having his first solo exhibition in New York City at Pablo’s Birthday Gallery. 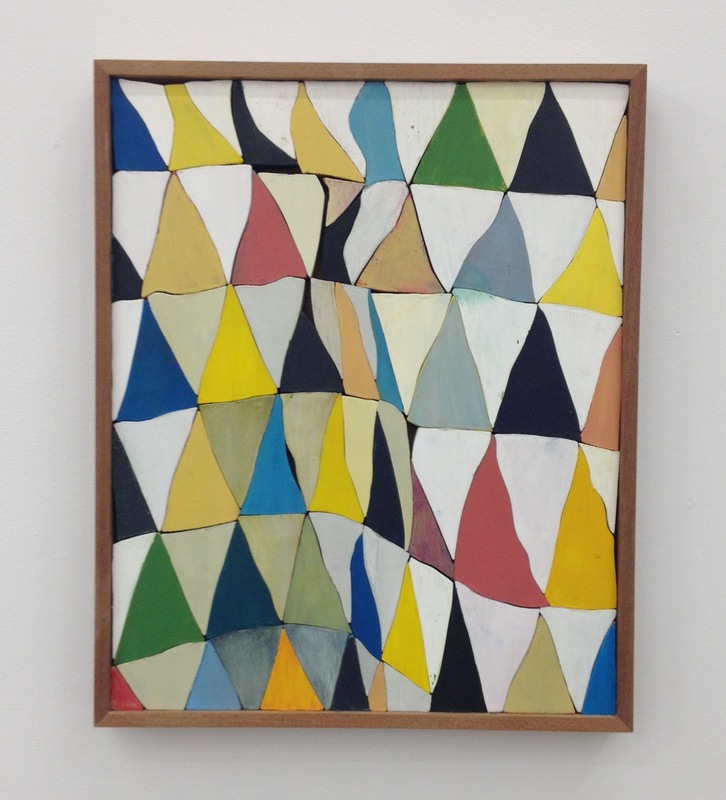 The title of the show is “We expected something better than before” and features wonderful abstract paintings, whose geometries are based on interior architectural elements. I have chosen two works that seem to me to have the most mathematical significance. The first painting is “Zeitland Schaft”, an oil painting from 2014. This work features four rectangles. Each is bisected diagonally to form eight right triangles. What I find interesting about this work is how it relates to the work of Piet Mondrian and Kazimir Malevich. Malevich used the geometric forms as his subject matter: the paintings were traditional in the fact that, even though he was depicting abstract themes, they were still pictures of shapes within a background. In Mondrian’s square canvases the square itself becomes both the format and the subject. There is no longer a delineation between subject and artwork. I feel that in some ways Fox’s work is taking this use of geometric forms a step further. In this painting rectangles and triangles might – at first glance – seem to be the subject of this work, but in fact it is much deeper. The geometric shapes are a vehicle for Fox’s use of layers of color and his lush painting technique. 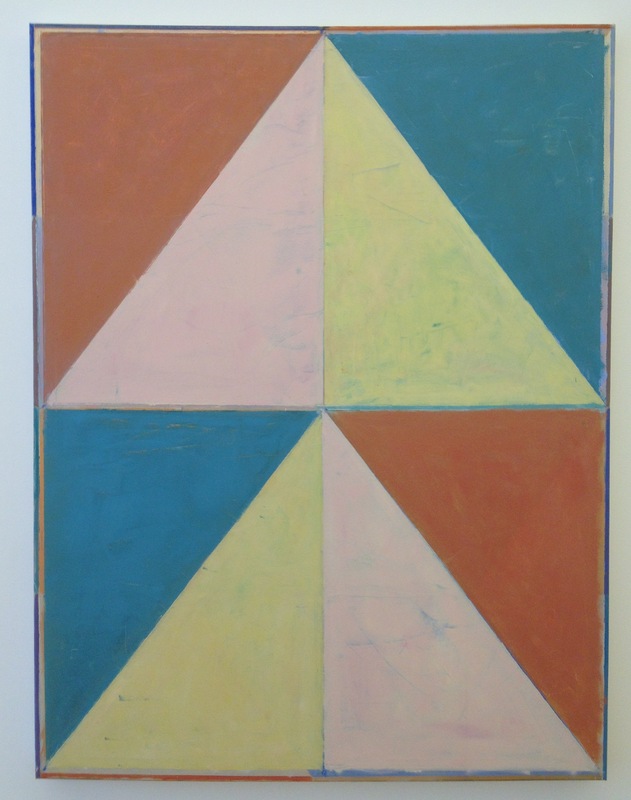 The symmetrical properties of the painting – for example the glide reflections in the placement of the pink and yellow triangles – enhance the relationships of colors, making them seem to glow. The next painting I would like to discuss is an untitled oil on canvas also from 2014. I Particularly like the use of both line and solid shapes this painting. Dividing the rectangular canvas into four columns and four rows, Fox has set up an interesting grid to draw lines connecting the points of intersection on the grid. Lightly drawing in both diagonals of each rectangular grid cell, he fills in a dark isosceles triangle in the top half of each. This creates a strong pattern that superimposes the other lines of the painting. Behind the triangles there is a 180 degree rotational symmetry to the red blue and gold lines. Looking at this painting the viewer gets the feeling that it is about more than just the geometry. Again,the shapes are the language that Fox is using to convey a sense of place. 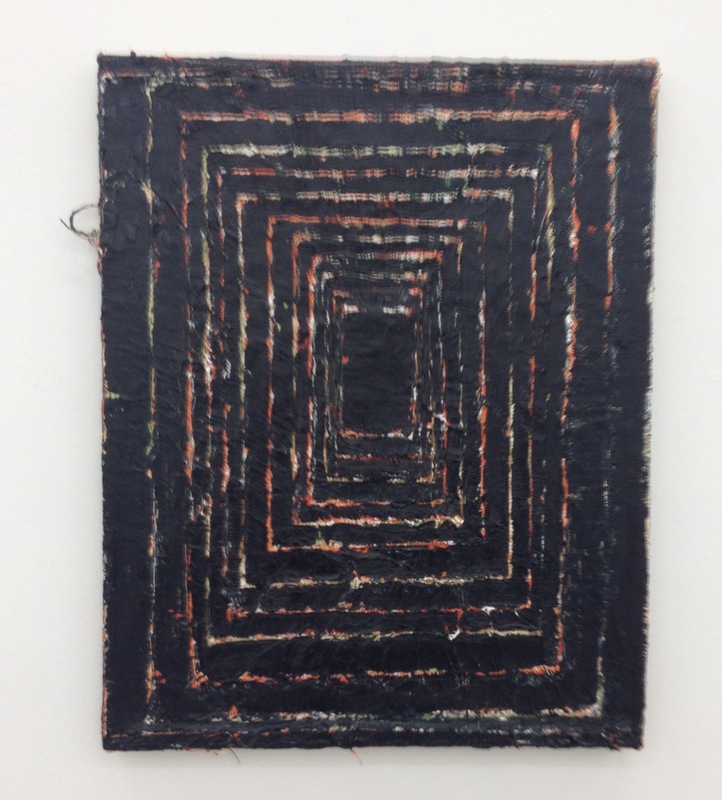 The Leila Heller Gallery is currently exhibiting painting and sculpture by Steven Naifeh. Many people will recognize the name Steven Naifeh. He is a world renowned art historian and academic who has published biographies on Jackson Pollock and Vincent Van Gogh. He is also an accomplished artist whose work is inspired by historic Middle Eastern architecture. Growing up in a diplomatic family, Naifeh was raised both in the USA and the Middle East. 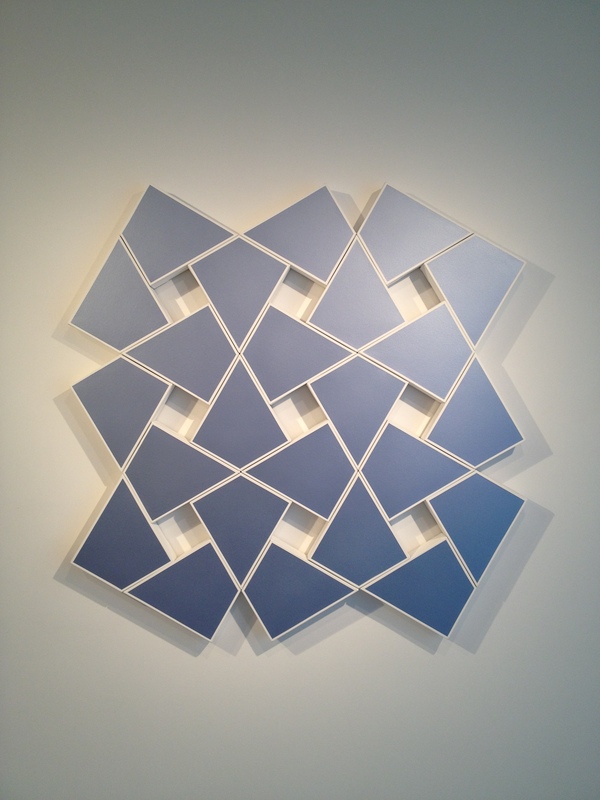 Building patterns with basic geometric shapes in repetition, Naifeh assembles complicated images. 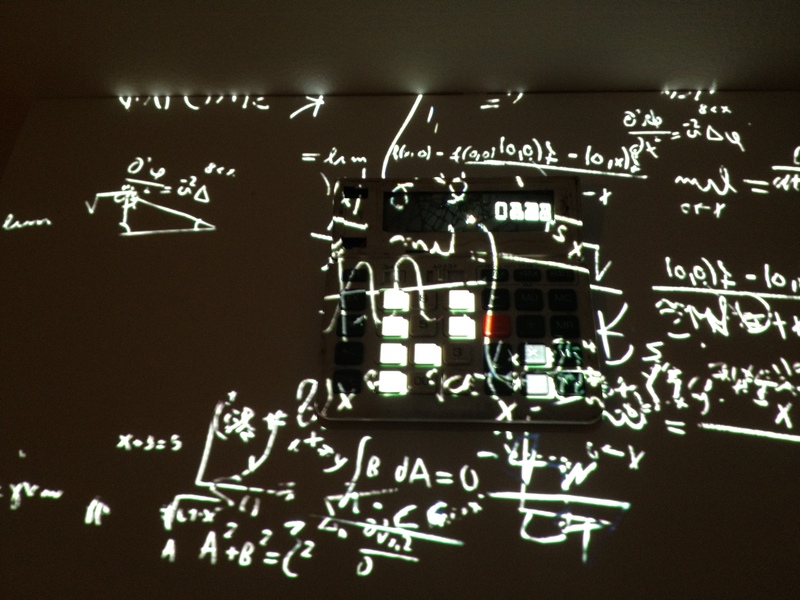 Using a computer to calculate the specifics, the shaped canvases and copper plated steel elements fit together with precision. The paint on the canvases has been applied using tape and a sprayer. This is a technique popular with Minimalist artists. To me these works however are a step away from Minimalism with their emphasis on pattern as it relates to architecture. In “Cyrene IX:Shimmering Sky” four identical kite-shaped quadrilaterals, each with two 90 degree angles make up each square. There is a smaller square opening within each large square. This puzzle-like painting is quite complex and visually satisfying. This is an artistic accomplishment considering that all of the pieces have the same shape and size, they have just been just repeated and rotated. 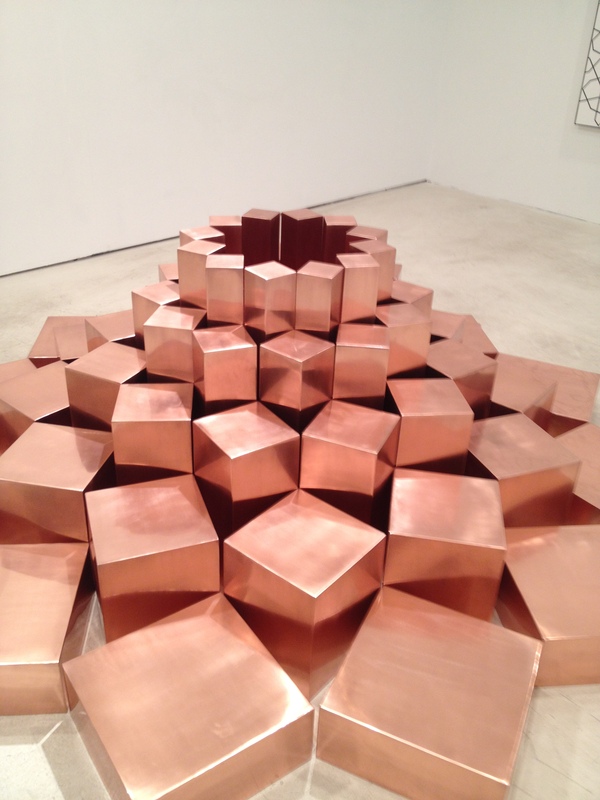 “Saida XXXVI” is a large scale copper-plated steel sculpture. It is composed of individual prisms with square top faces. The prisms in the outermost ring have the largest square top faces, but are the shortest. Each consecutive ring of prisms have smaller top faces but are taller, in the 5th and center ring the prisms have the smallest square top faces and are the tallest. This sculpture takes up most of the floor space in one of the gallery rooms. Gallery patrons interact with this structure by walking around the circle of prisms. “Saida XXXVI” for me was the piece in the show that most closely aligns itself mathematically with Middle Eastern architectural elements. Naifeh has created an elegant blossom using only a collection of simple square faced prisms. Many artists cite historic buildings and decoration as their inspiration, but very few have been as successful as Naifeh in making these connections seem contemporary. His process of fabrication and his choice of materials bring the beauty and essence of Middle Eastern architecture into the aesthetics of the 21st Century. The Curator Gallery is a unique type of gallery. Recently opened by Anne S. Moore, exhibitions at the gallery are developed using visiting curators. Each show will have a different perspective and vision because the curators will always be changing. The inaugural exhibition “Second Nature: Abstract Art from Maine” was curated by Mark Wethli, a professor at Bowdoin College and a painter exhibiting frequently in the North East and in California. 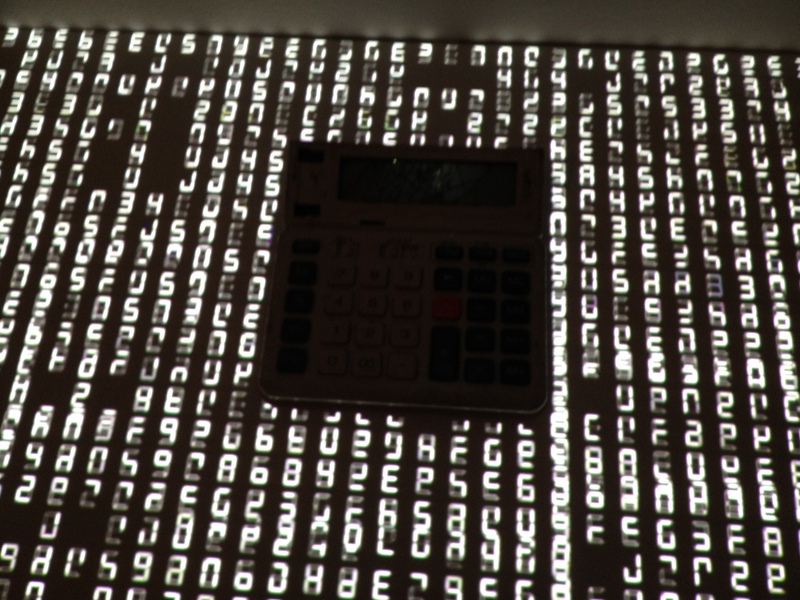 Two of the artists included in this show create work with mathematical connections. Clint Fulkerson’s intensely detailed gouache drawing “White Nebula 9” from 2012 began with simple geometric figures. Through detailed repetition of self-similar forms the drawing grew into a weblike fractal pattern. 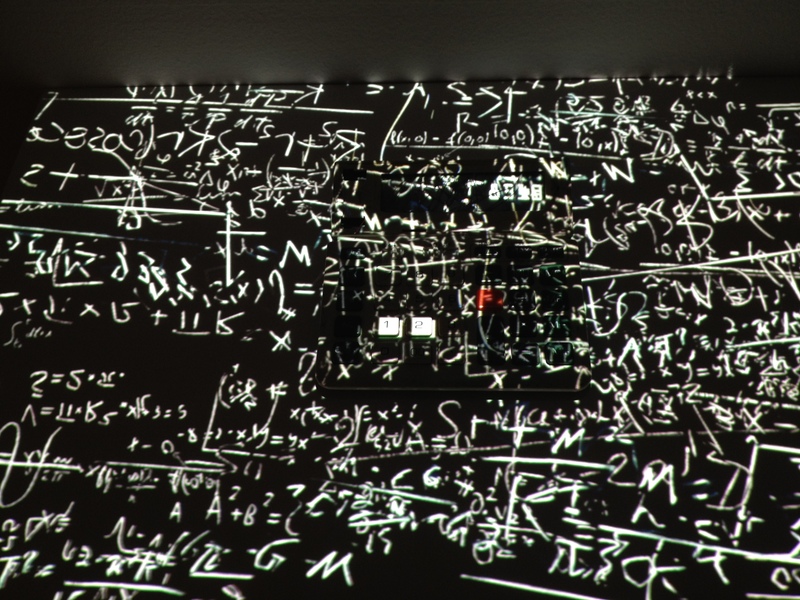 According to Fulkerson’s Artist’s Statement: “For each piece I set up a starting condition and devise a set of rules, which are much like algorithms,that limit what and how forms develop.” Fulkerson’s drawings relate to mathematics on two levels. His process is a rule-based system, and the theme of his work is the growth of forms using self-similar geometric elements. What I really liked about “White Nebula 9” is the different density of lines throughout the drawing. In some places the lines are sparse enough that the geometric structures are clear and straight forward. In other sections the accumulation of lines becomes almost feverish with detail. 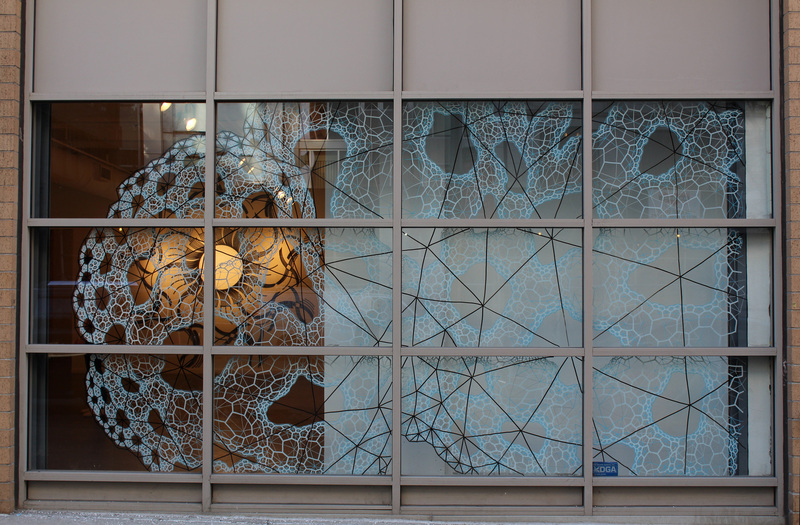 In addition to work on paper Fulkerson makes large site-specific drawings on walls and windows. He has created a black and white drawing in the front window of the gallery for this exhibition that beacons to pedestrians of 23rd street to take a closer look. 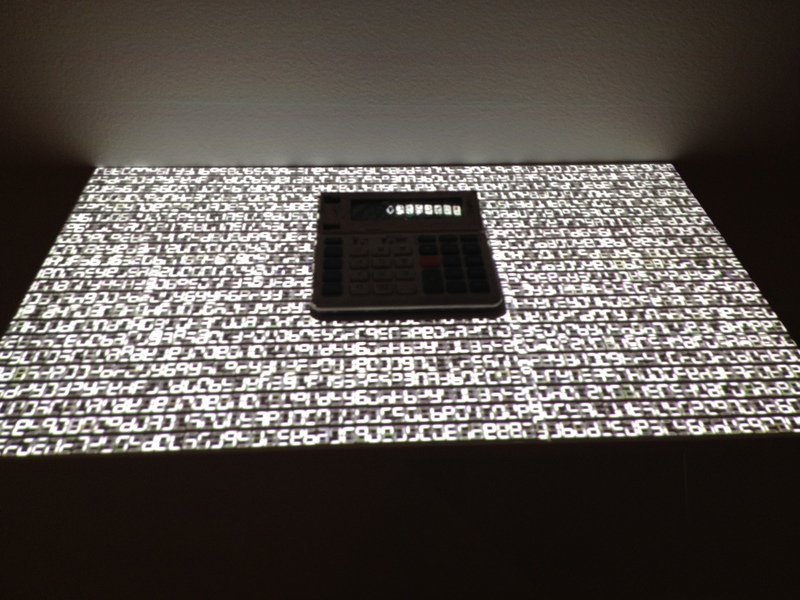 The second artist in the exhibition whose work has mathematical elements is Joe Kievitt. His ink and acrylic paintings on paper are created using an arduous system of taping off sections of the paper and then applying pigment. This produces geometric abstractions with crisp lines and edges. 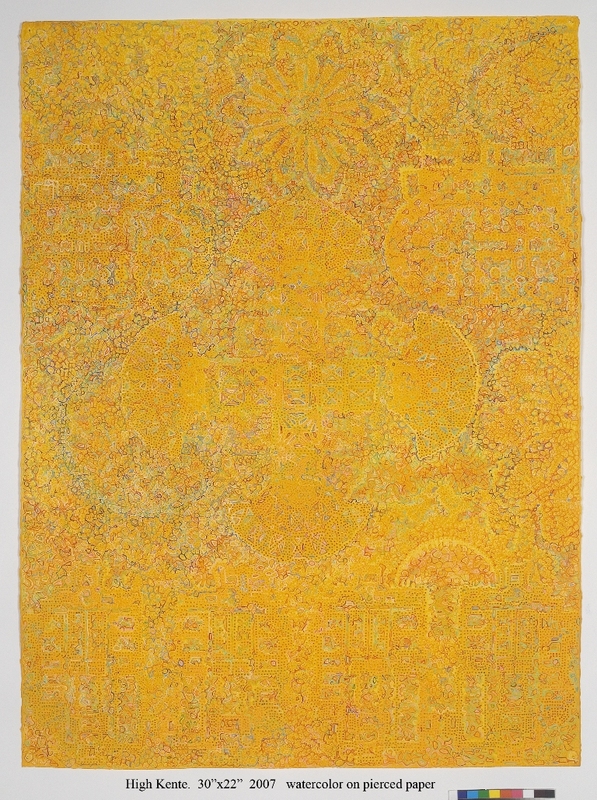 Kievitt cites numerous historical connections to his work including Islamic mosaics and quilts, two areas with well documented relationships to mathematics. Kievett’s painting “XXL” features a gridded structure comprised of X’s. In the top and bottom rows the columns have only one X. Each of the center 7 rows the columns have two X’s one over the other, creating vertical rectangles. Disregarding color there are both a vertical and a horizontal lines of symmetry running through the center point of the paper.